Go to Email / Edit and Send and locate the email you want to send or schedule. 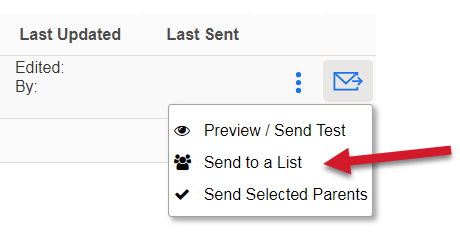 Choose Send To then Select a List. Data Confirmation: you can send to all parents or just those that have NOT confirmed. 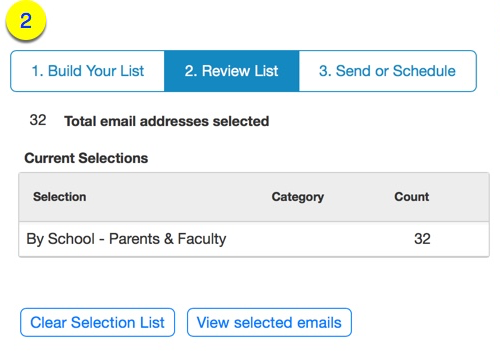 Tip: use the signup feature to create custom lists of parents and faculty. Click on the FIRST field - Families - to see your options. Select one or more lists from the dropdowns available. For each group, select the option and then click "add to email list". Keep selecting until you are done. For example you may want to send to parents in both 4th and 5th grade. Select 4th and Add to Email List then select 5th and add to email list. Note: Emails that contain a Signup link cannot be mailed to faculty. The reason is, faculty do not currently have access to Signups. Sorry for the inconvenience! 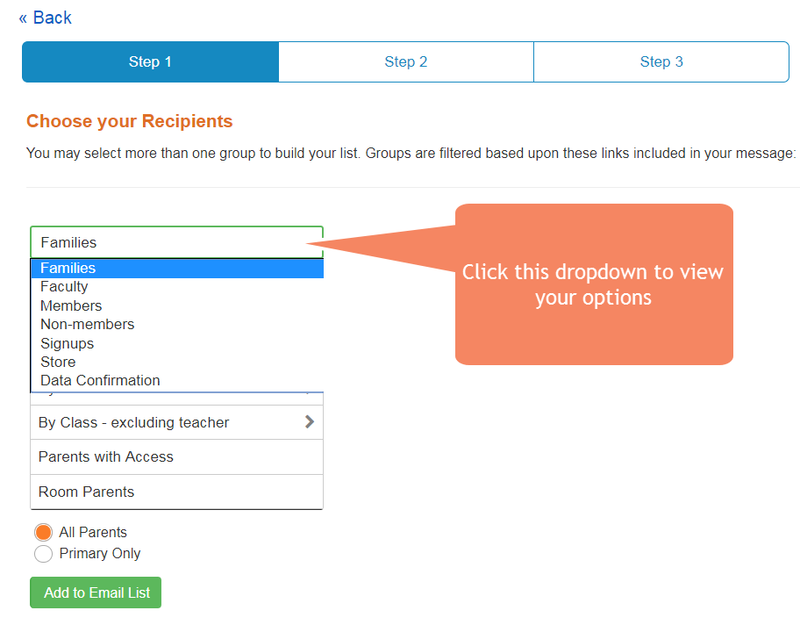 Review the groups you have added to your recipient list. You can add more by returning to Step 1 or clear your choices and start over. Specify if you want to send your email now or later. Send: Instantly adds your email to the mail queue. Depending upon the number of recipients and timing, this could take up to 2-3 hours for all recipients to receive the email. 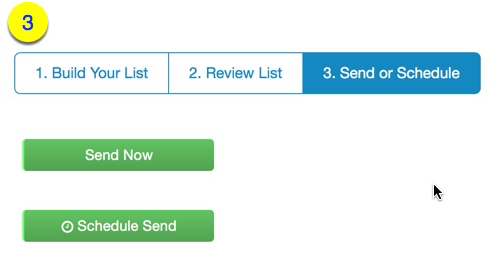 Schedule: Choose a future date and time you'd like the email moved to the sending queue. Some customers schedule email to send at a particular time, such as Sunday after dinner or weeknight sleeping hours. The benefit for doing so is to have the email arrive a the 'top of the inbox' during a time of day that parents are more receptive to reading email. Another benefit to scheduling is to complete the setup of initial and follow-up emails at the same time, preventing the need to return into the system at a later date just to send.